It was nearly 80 degrees, unusually windy and two o’clock in the afternoon—not exactly ideal birding conditions. On the plus side, the calendar said April 10. Spring migration was well underway, so there would be plenty of birds around. Hopefully some big ones, too. Yes, big ones, because I was about to lead a group of Cub Scouts from St. Charles on a bird walk at Cantigny Park. My experience with guiding youngsters is slim, but this I know: large birds are easier to see. Better to show kids without birding experience a great blue heron standing by a pond than a warbler flitting around in the treetops. Oh, and the turkeys! The boys would love seeing those. Wild turkeys are sort of a way of life at Cantigny these days. It’s quite common to see one or two birds pecking around the buildings or under the bird feeders. Sometimes a flock of 10 or more birds will appear, perhaps wandering over from St. James Farm. I didn’t mention the turkeys during my pre-walk comments to the boys—the park was full of people so maybe the gobblers would be laying low. But before setting off I did ask the Scouts about their favorite birds. Eagles, hawks, vultures and owls, they told me. Big, awesome birds—the kind all little boys seem to like. Pack 151, Den 3, would not be impressed by a ruby-crowned kinglet. OK, enough talk, time to go find some birds. The Scouts, some parents and a few siblings followed me east from the Visitor Center, toward the rose garden and prairie. My 10-year-old son, Jay, tagged along too, documenting the adventure with the family Nikon. Chickadees, robins and cowbirds gave themselves away first, allowing the kids some practice with their loaner binoculars. Soon we were on the wood chip trail that runs between the Scout campsites and the golf course. The trees give this area some shelter from the wind, and it’s good habitat for woodpeckers and nuthatches. What happened next was remarkable—a miracle of good timing. A large brown bird swooped toward us through the woods and landed fairly close, in plain view. Wait a minute. No way. At this time of day? Sure enough, it was a great-horned owl! Just seconds after the owl landed, a huge turkey vulture performed a low flyover, not far above the owl itself. I had the sense that little jaws were dropping to my left and right. But in a moment the vulture was gone. Now, as the leader, I wanted to make sure all the boys had a good look at the owl before it was too late. How many of them, I wondered, had ever seen one in the wild? This was a truly exceptional opportunity. Fortunately, the big not-so-nocturnal raptor stayed put, apparently as curious about us as we were about him. Even for me, this was a first. 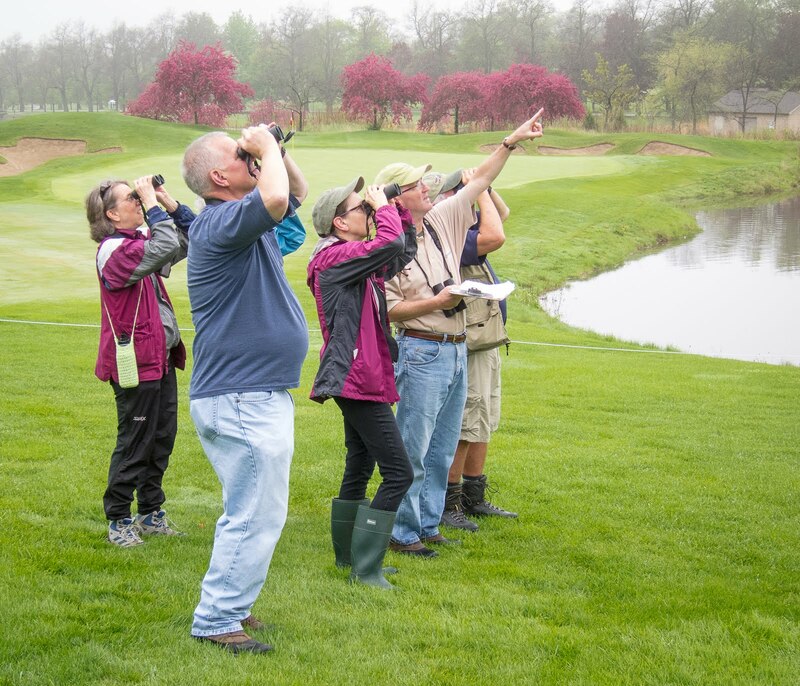 With help from the DuPage Birding Club, I’ve been leading monthly walks at Cantigny for almost three years. On those walks we’ve never encountered a great-horned owl. Not once. Seldom have I seen one in broad daylight anywhere. We watched the bird for about 10 minutes. It was clear that anything else we might see would be a bonus—the walk was an official success. Up the path we observed bluebirds, flickers and red-bellied woodpeckers. Beautiful birds, all of them, but nothing was going to upstage Mr. Hoots. Our search party never did spot a turkey. We also struck out (or “dipped,” as the say in Britain) on red-headed woodpecker, another Cantigny Park specialty. Trust me, the boys didn’t mind. We were now outside the First Division Museum. Enough of this bird business; it was time to climb on tanks and make some noise! No offense taken. We’d had a good hour of birdwatching and that’s plenty long enough for most second graders. The parents soon pried the Scouts off the tanks and marched them over to the Cantigny picnic grounds. Time was short. They had a schedule to keep. After dinner the boys were going fishing at Blackwell Forest Preserve. Birds had been a small part of their busy day. Would they even remember what they’d seen? Would any of them ask to go on a bird walk again? Maybe or maybe not. But there’s something else I know: It only takes one bird to create a spark, and close encounters with big, awesome, yellow-eyed raptors are not easily forgotten.